ReneG July 16, 2002 post on Calumet Fisheries wrote: Although certainly not unique to the city, the shrimp and fish shack is (or was) very much a Chicago tradition. These places, often with very late hours, located on the banks of the river, and called Fisheries, were once numerous but are quickly disappearing. I don’t know the history but I assume their location on the river was to allow easy delivery of fish, important in the days before frozen food, interstate highways, and cheap air freight. Not long ago we lost one of the great ones, Joe’s Fisheries on Cortland. There are at least three riverside fish houses left: Goose Island Shrimp House, Lawrence’s Fisheries, and Calumet Fisheries. All are very old businesses. Calumet Fisheries, on the banks of the Calumet River, is a real favorite of mine. Some really awesome views of abandoned steel mills and other industrial vistas. You really have to keep yourself from wondering too much about where that fish comes from. It’s really quite good though; everything is freshly breaded and carefully fried. The fried shrimp is good but they make their own smoked shrimp that is fantastic. These are seriously addictive. There’s a little smoke house outside where they make it and they also smoke salmon and trout (each chunk is threaded with a loop of twine for hanging). Take out only. ReneG's long ago post offers the history and context for why Calumet Fisheries is GNR worthy. 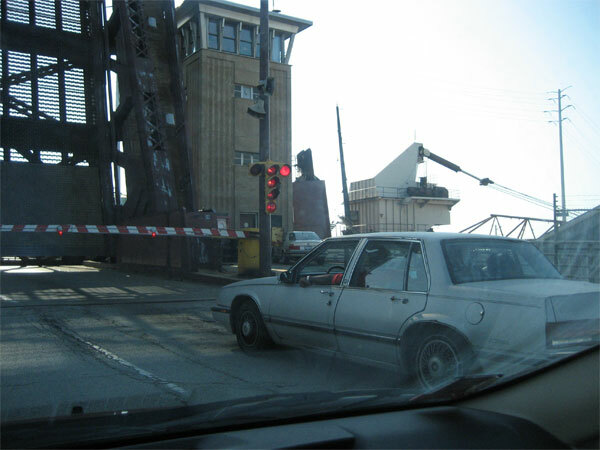 In more contemporary history, the bridge it rests on is where the Blues Brothers jumped the bridge in their Bluesmobile. Fortunately Calumet Fisheries is not sitting on their laurels or living off the vapers of a 25 year old movie, they are a serious provider of well prepared fried shrimps, fish and other seafood. They also smoke on the premises salmon, trout, chubs and some spectacular jumbo shrimp. Life is good when specialized food vendors reside and thrive in the great neighborhood we call Chicago. On this occasion I nominate Calumet Fisheries. Last edited by Cathy2 on August 26th, 2007, 5:37 pm, edited 1 time in total. Great nomination, and I say that without having been there, but you are quite right, it is so redolent of a side of our food history which is all but ignored today. I passed up Calumet Fisheries last night on a circuitous route back into the city and had flashbacks to a smoked salmon bonanza I had on New Years' day. I heartily support this nomination! Last edited by crrush on June 21st, 2006, 7:32 am, edited 1 time in total. Im 100% behind this nomination. Whenever I come home from a summer house in Michigan this place is a must stop. They have what I believe to be the best fried shrimp in the city. I just love to order a full pound with a hot and mild and then dump both sauces in the box and shake well, pure bliss. While I haven't been a fan of Calumet's fried items, there's a lot to love about this little shack. Their smoker has a magnetic effect on me. When I'm within a 30-block radius of Calumet Fisheries, I can't stop thinking about smoked shrimp. History, location, respect from this forum, and their very special smoked items add up to a GNR in my book. So on our way to the Indianapolathon, and knowing we'd have to stop somewhere for a snack for the kids before Mug'n'Bun at 9 pm, I had the bright idea of pulling off the Skyway-- right after paying my $2.50-- and zipping over to Calumet Fisheries just a few blocks away. Problem #1: railroad tracks on 95th are blocked for some big reconstruction project. So, actually knowing just enough about this area to get around thanks to visits to Tacos del Pacifico, we zipped down a few blocks, over to Ewing, and back up. Watching this enormous barge being pulled down the river by a tugboat while eating shrimp would have been a great way to spend 20 minutes with the kids. Waiting on the other side before we got to the shrimp hut... well, we just had to be philosophical and enjoy it anyway. Finally got to Calumet Fisheries, ordered shrimp, smelts and fries. I don't know about you, but (as a dilettante who never had to face the reality of working in an industrial plant) I love this part of Chicago, the crumbling yet still awe-inspiring monuments to American industrial might in the 20th century. And as the kind of place that fed the men who made the steel that built this country and won the war,* Calumet Fisheries is living history, one of the last surviving links to the era when Chicago's power and stature in the world was defined by the river, the steel mills, and the labor movement made up of guys who ate at places like this. Every order of freshly-fried, cornmeal-battered shrimp is a fanfare for the common man, and the common man's lunch. * The war. You better know which one I mean. By the way, if you're interested in this period, there's a great 1930s industrial film called Master Hands which you can watch online here. It takes a couple of minutes to really get going but the bombastic-heroic footage of a Chevrolet plant in action is pretty thrilling, if you dig that 30s WPA style like I do. It's in four parts, other three are here here and here. Filmed around the same time as the Flint strikes in the mid-30s, there's a definite "what assembly lines? Our guys are all old school craftsmen who don't need no union" message to it (especially ironic given the Soviet influence on this style of documentary filmmaking), but in any case, it's cool to watch. must surely be amongst the best versions in the city. Just about every time I drive through Indiana, I'll forgo the Skyway in at least one direction in favor of city streets in order to stop at Calumet Fisheries. This is a place that has been at the top of its game since long before LTH Forum existed and isn't likely to change any time soon. I can't think of a better candidate for GNR Renewal. 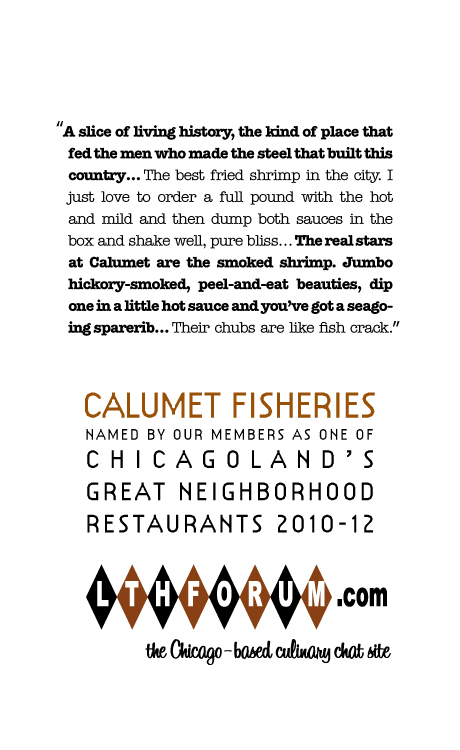 Met a guy on Saturday who was singing the praises of Calumet Fisheries. He seemed surprised that a Northsider, like myself, was even aware of the place. He was even more surprised when I told him I thought the fried shrimp paled in comparison to the smoked. 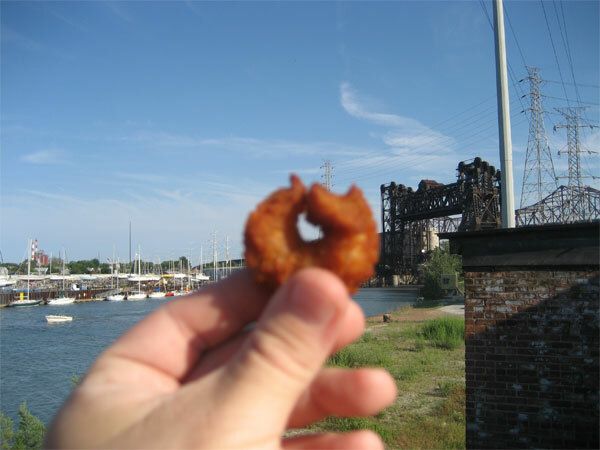 He had only, in many many visits, had fried foods at Calumet Fisheries. Here is a fellow in for a treat! Love the smoked shrimp, dream about the smoked sable. Heartily endorse a GNR renewal for Calumet Fisheries. Ditto. I dropped in last weekend. 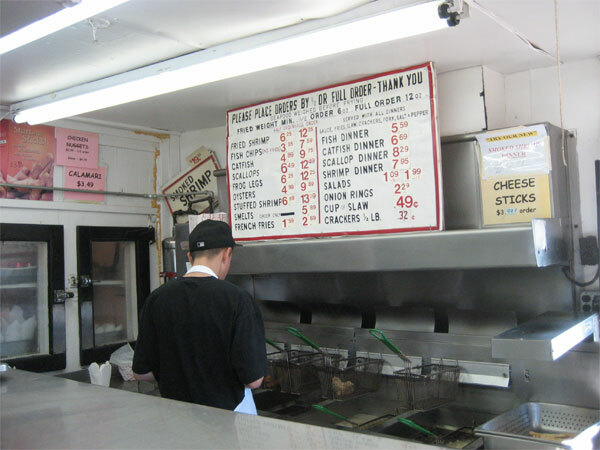 Calumet Fisheries is as regular a stop for as Peoria Packing when visiting Chicago. I've been coming here since I was a kid. I once rode my bike there from Rogers Park. Standing on the bridge eating, it's one of the few places that live up to my memories. Agreed; its history alone merits consideration and respect, and the fact they continue to turn out a quality product so consistently should continue to GNR and reGNR it regularly. or has anyone encountered people in the area referring to the smoked chubs as "fish crack?" I'm dead serious. I could just ask MJN, but Rene and Gary have probably spent more time in the area. The pop etymology of "[x food] crack" is something I'm working on. I never heard the reference to 'fish crack' until Trixie Pea mentioned it in a Calumet Fisheries post. One of Calumet's employees follows this website, especially comments on their enterprise. He had already printed and mounted their GNR before I arrived to deliver it. If they are now using 'fish crack,' then it might have been influeced from here. Of course it could be a convergence of events. Please note history or community good works is not what earns a GNR, there has to be food excellence to match. I mention this not so much for your benefit, but for those making future nominations. Of course, since I nomimated Calumet Fisheries and continue to frequent when I am in the neighborhood, then I am reiterating my support. Some may continue to patronize an establishment because of nostalgia. On the other hand, as a tough critic that doesn't suffer food or service slights well (ask anyone that's ever dined with me) what I said was that it lived up to my memories. In case there's confusion, I back Calumet fully on quality. It's nice that it's managed to be as good for as long was my point. The smoked whitefish, salmon, sable and shrimp have been on my table since my father would load a pre pubescent me into the car and take the long drive down LSD to bring home the goods. In this case, sometimes you can go home. My husband's job takes him all over the city and suburbs, and even though I pack him a lunch every morning, sometimes he is compelled to ditch the homemade sandwich and get something else. Right around Valentine's Day he stopped at Calumet Fisheries and picked up a half pound of shrimp with fries and ate it as he was driving around to the next job site. When he called to tell me (after he was long gone from the area, of course), I started whining because he didn't get some smoked fish for me. I really don't care how much it smells up his work truck. I'd rather have a pound of smoked chubs than a pound of chocolate any day. sdritz wrote: My husband's job takes him all over the city and suburbs, and even though I pack him a lunch every morning, sometimes he is compelled to ditch the homemade sandwich and get something else. Right around Valentine's Day he stopped at Calumet Fisheries and picked up a half pound of shrimp with fries and ate it as he was driving around to the next job site. When he called to tell me (after he was long gone from the area, of course), I started whining because he didn't get some smoked fish for me. I really don't care how much it smells up his work truck. I'd rather have a pound of smoked chubs than a pound of chocolate any day. My wife and I made a trip down here to try some shrimp. We had a 1/2 order of fried shrimp and a 1/2lb of smoked shrimp (this was more like a stop for some "snacks" while exploring the southern side of Lake Michigan). Both were delicious. The fried shrimp lasted about 3 minutes! Not greasy at all and the breading was very good. The mild sauce they serve is also terrific (I'll have to try the hot sauce next time). I ate the smoked shrimp once I got home. Great texture and flavor with a nice subtle hint of smoke. We will definately be going back to try some other items. Another great GNR! If I can't have everything, well then, just give me a taste. Today is my mother's 75th birthday. We had no idea what to get for her, because she usually says not to get her anything -- and she means it. My husband was working a block away from Calumet Fisheries and decided to stop and pick up a couple of smoked chubs. Even though it's not my birthday, he got me a few, too, in a separate package. I'm going to slap a bow on the package and he can present it to her at her birthday dinner tonight. I'm sure his gift will be a big hit. Big YES on renewal. 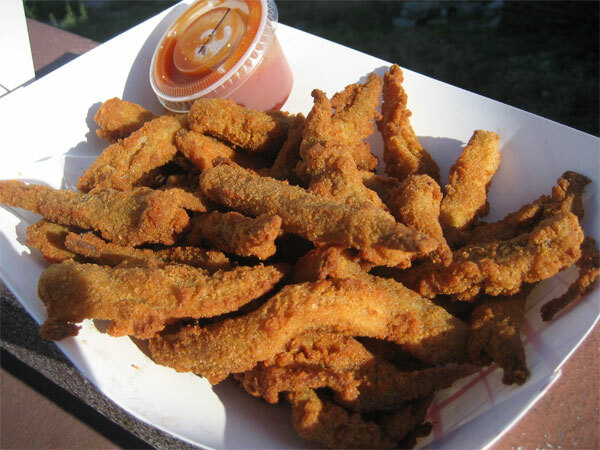 As a kid I went for the fried, as an adult I prefer the smoked. Show me who smokes fish better in town? No one. I've only been 3-4 times, so I can't say that my experiences span a huge sample set, but count me as a big fan of Calumet. If they were any closer (it's about 24 miles and I don't own a car), I'd be there all the time. Smoked chubs, salmon, and shrimp are all fantastic. Fried shrimp and smelts are the best I've had. 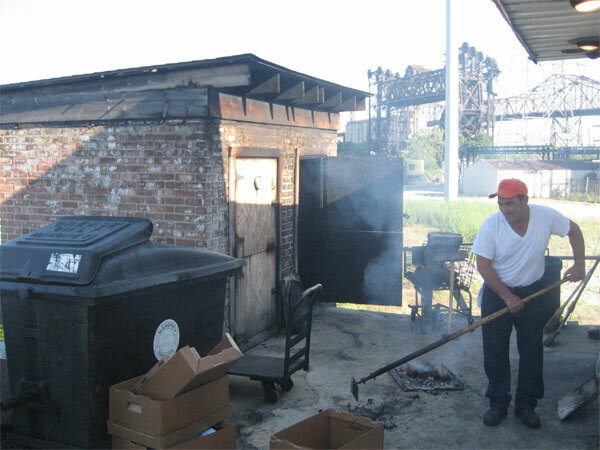 The last time I went, I got a tour of the smoking operations and got to try salmon collars pulled hot from the smoker. My friend who was visiting from out of town was so enamored with the fish that he brought a bunch back to his hotel room and lived on almost nothing but Calumet smoked fish until his flight home 2 days later*. My SO brought smoked chubs back to her Dad, who thought they were the best he's had... since his last visit to Calumet roughly a decade ago. Per the useless Twitter, Calumet Fisheries was just officially named as a James Beard Amercia's Classic. Just an awesome and totally distinctive place, which happens to also turn out the best food of its kind in Chicagoland. A very worthy renewal, IMO. ronnie_suburban wrote: Just an awesome and totally distinctive place, which happens to also turn out the best food of its kind in Chicagoland. A very worthy renewal, IMO. I found myself recommending Calumet Fisheries to someone just two days ago, and that was not the first time this month. Calumet Fisheries, count me a fan! There used to be quite a few smoke shacks in Chicago. Calumet is the last one standing and still turns out the goods day after day. I can't count how many times I've taken surface streets to Indiana rather than the Skyway just so I can stop at Calumet for some fried shrimp and smoked fish. Eating Calumet fish hanging out on the 95th street bridge is one of the true joys of summer. I say yes on renewal. Not to quibble, there is one other smokehouse in the city at Hagen's. When CAlument Fisheries was contacted by the James Beard Foundation for their recognition. The owner did a quick google to understand what was being offer to them. Only then did it dawn on them they were receiving the equivalent of an Academy Award's lifetime achievement. Calumet Fisheries practically shrugs off its specialness while in pursuit of smoked fish excellence. They are a great resource as well as pretty modest. As the original nominee, I am pleased to endorse a continuation of their GNR status.